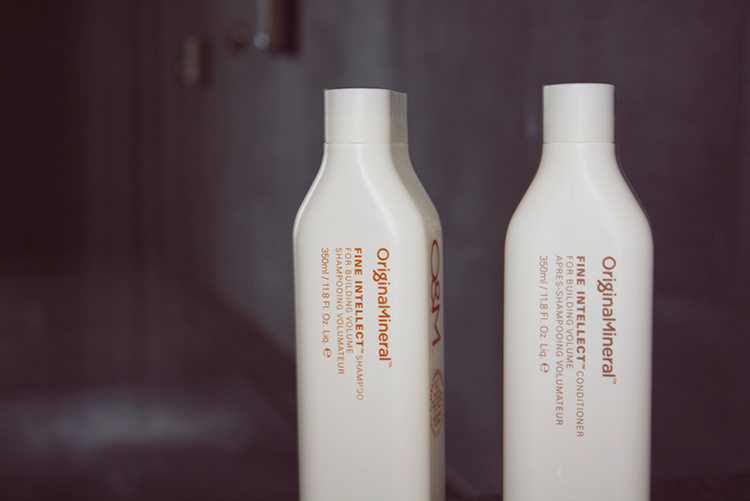 Today I’d like to highlight a new hair poduct line which I recently discovered: Original Mineral. Many people don’t put much thought into the haircare products they use, but it definitely matters! Have you ever looked at the back of any bottle of shampoo? I recently did and found all kinds of ingredients that I can not pronounce, let alone understand, that are harmful for your hair. Using these products, that contain chemicals, can strip away all the nutrients and natural oils that you hair needs to be healthy and even cause unnecessary damage. It’s not often I get extremely excited about haircare products, but switching to these Original Mineral products really made some noticeable positive differences to my hair. I’ve tried all the products for 10 days to make sure that it actually does what it says and to give you guys my best judgment. Their products don’t contain the harsh ‘everyday’ chemicals, including parabens, triclosan and MIT, that are typically found in most of the hair care products that you find in any grocery store or drug store. They replaced these harmful ingredients and all their products are based out of some of nature’s most beautifying ingredients found in Australia, the birthplace of Original Mineral. Unfortunately, I’ve earned my thin hair from my otherwise lovely dad. This is especially frustrating since my mom has the most beautiful thick hair, but her hair genes were passed onto my little brother! That’s why I’m always looking for products that give my hair a bit of extra volume. I also have a huge phobia for greasy roots and that’s the reason I wash my hair everyday. I know a daily dose of shampoo actually does more harm than good to my locks and I hate to do it, but it always seems absolutely necessary when I look in the mirror in the morning. So here’s what I noticed after using these Original Mineral products: I started to see that my hair is less greasy than usual and yesterday I even skipped a day in between shampooing ,without it looking sticky. Voluminous, shiny and grease-free hair, here I come! This shampoo lathers up great, cleans well and leaves my hair feeling soft, voluminous and it adds a great shiny and healthy glow! I use almost all of the conditioner on my ends and blend whatever residue is left on my hand, into my hair. This conditioner is my favorite! It made my hair feel silky smooth and I could easily brush it trough. My hair usually gets tangled super quickly – a tip for girls with the same problem: Take a brush under the shower and gently start to comb your hair once the conditioner takes effect- and the best thing about this conditioner is that it doesn’t weigh your hair down at all. This spray is meant for use after you have washed your hair to create some extra volume. The product has a sort of mousse structure and I’m really happy with this product because it really gives my hair extra volume (especially on the roots). If you’re up for an Erin Wasson’s beachy hairdo this product is great to create it! I’m a huge fan of their line, all their products have very nice fragrances, fruity but not overpowering. Posted in BeautyTagged 100% natural, conditioner, haircare, no parabens, shampooBookmark the permalink.